Burrata, meaning ‘buttered’ in Italian, is a soft cheese made from mozzarella and cream – think a snowy white cheese sack filled with silky, buttery goodness. With its subtle flavour and soft, creamy texture burrata makes the perfect addition to crisp summer salads – just take care to dress it simply to let its smooth richness shine through. 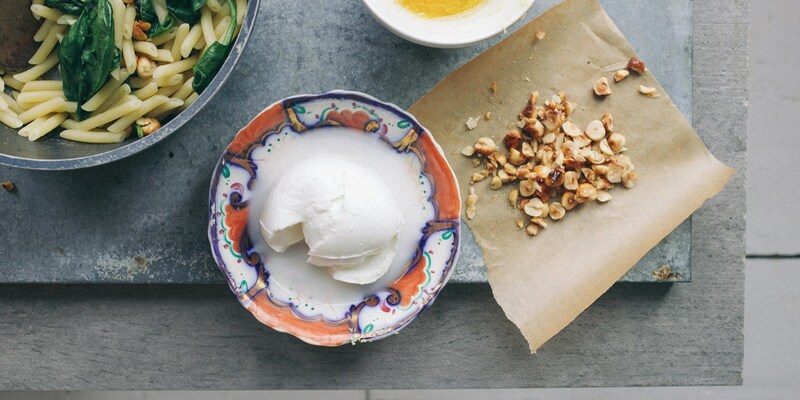 This collection of burrata recipes contains some fantastic inspiration for serving this delicious, increasingly popular cheese. Shaun Hill's Burrata with chickpea fritters recipe makes a fantastic summer salad dish, while Xavier Boyer's Burrata salad with beetroot and radishes is a simple starter recipe which looks both striking and sophisticated on the plate – perfect for impressing guests with minimum stress. For a wonderful midweek dinner try Georgina Fuggle's Spinach, lemon and garlic penne rigate recipe, where the pasta is tossed through egg yolk and sprinkled generously with torn pieces of burrata.